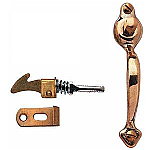 This unique solid brass knob includes a push button latch. 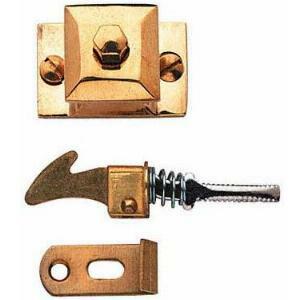 Knob mounts to door with two screws. Can be used with doors 3/8" thick. 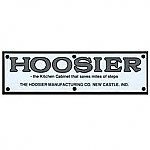 Aslo can be used on Hoosier style cabinets needing this type of application. 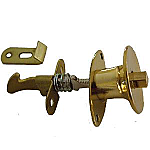 Knob Base: 1 3/16" x 1 5/16"
Package contains one push button knob, latch, catch and mounting hardware. Item ships same or next business day. This item is $9.36 when your order exceeds $250 before shipping in qualifying items.